This collection of writings Goenkaji s explanations of the teaching of the Buddha, the Buddha s scriptural verses, poetical stories of monks and nuns from the time of the Buddha, accounts from fellow meditators is born of the acceptance of the truth of suffering. It contains inspiring examples of people gaining strength and a taste of freedom through their practice, and demonstrates convincingly the efficacy of the Path, the way out of misery. These stories not only help to sustain and strengthen established Vipassana meditators in their quest, but also to encourage others searching for peace and understanding to take up the practice of getting to know thyself truly, on an experiential level to develop their own wisdom. 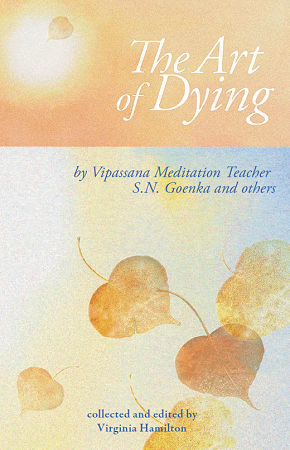 A thoughtful look at the greatest challenge facing each of us: death, whether our own or a loved one s. Weaving together material from many sources, this collection provides a context for understanding death and experiencing it with awareness and equanimity. Here are passages from the Pali texts, writings of S.N. Goenka, poems, theoretical expositions, and questions and answers. But perhaps the most compelling parts are the sections by or about meditators confronting the end of life. With humility, tenderness and often a smile, they learn to accept their own impermanence, suffering and non-self. Their courage and compassion give every Vipassana meditator an example to which we can aspire. I was inspired by the stories of ordinary people who faced death with exemplary poise and courage, and who attributed this gift to Vipassana meditation. Brings a piercing light to a universal reality too often darkened by ignorance, fear and mythology. Alternately intelligent and moving, instructive and poetic, scientific and devotional, it examines its important subject from a variety of angles in its quest to explain and accept the great mystery of death. That it does so in such a concise and readable way is truly remarkable. I imagine there is no better way to experience the end of life apart from meditating or living it oneself than to read these beautiful stories. I wanted to know how to print it as its password protected. I read this book in one breath within about 5 hours because it was very interesting to see how people reflect on the death of their loved ones who passed away peacefully and also faced the difficult situations in sickness. The book is a must read for everyone who knows that they will die for sure one day-means all humans. All those reflections would help understand how one can help their loved ones to passaway and leave you behind happy, contented and calm. Also for those who are left behind to feel so good how they had their last moments. This is useful to anyone as it will help understand how one can help all around them with an understanding of what death really means.